Join us in maintaining and creating healthy landscapes! Participate in the clean up of Clifton Nature Park Friday, Sept. 29 from 8 a.m to 12 p.m.
After pulling weeds and picking up trash, stick around for a descriptive nature walk. Make sure you pack sunglasses, sunscreen, snacks and water. We recommend you wear a long sleeve shirt, long pants and sturdy shoes. We will have some gloves available, but if you have a favorite pair— please bring them along! Meet at the Clifton Nature Park parking lot, which is located on the south side of D Road between 32 1/4 and 32 1/2 Road, next door to the Clifton Sanitation District. 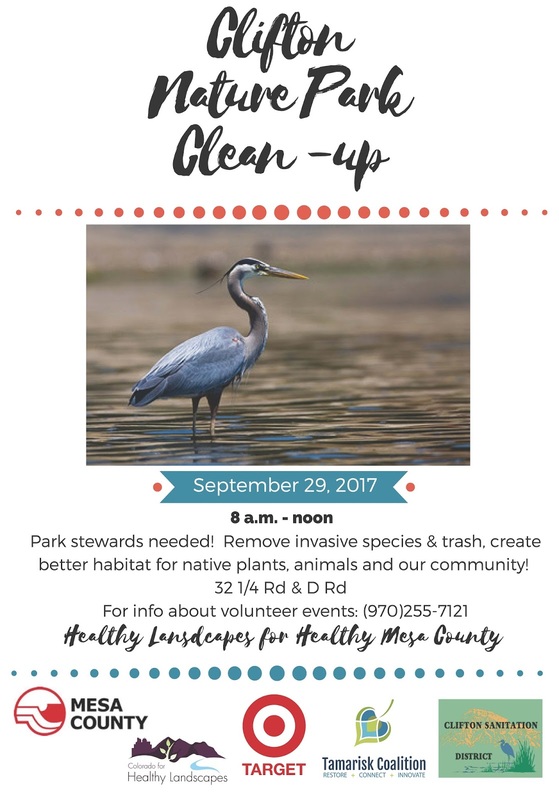 This Clifton Nature Park clean up is sponsored by Mesa County, the Tamarisk Coalition, Clifton Sanitation District, and the Grand Junction Target store.